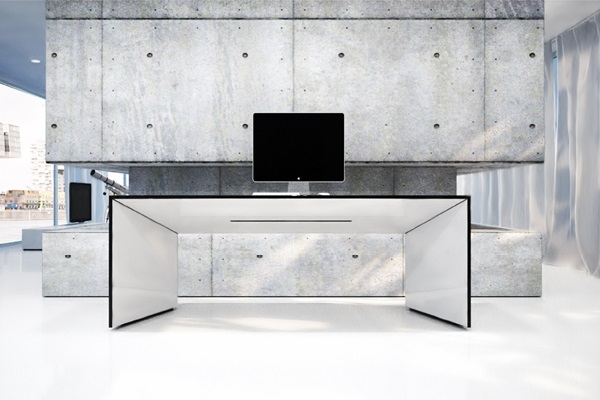 German architecture and design firm RECHTECK Felix Schwake has launched the Commentor, a minimalist desk with a vast working surface. In spite of its streamlined look, its technological details, even if they are hidden, have hardly been neglected. By gliding a part of the central panel toward you, storage space is revealed together with everything you need for connecting your computer or multimedia devices. Say goodbye to unsightly wires, pencil holders and other distracting accessories. A common theme in Rechteck is to fully integrate furniture into a room or space to prolong its lifespan. The Commentor is available in various lengths and depths, but you can have it custom made upon request. The client also has the luxury of choosing the material from which his or her Commentor desk will be made.